LEGO fan and flickr.com user nabu_tabry whose creations were blogged multiple times in our blog like the red robot and centaur knight shared his version of Keneda's Bike in his photo-stream. This version has a nice trans-light-blue windshield. The shaping is done greatly but there is not a single one sticker used for decoration. 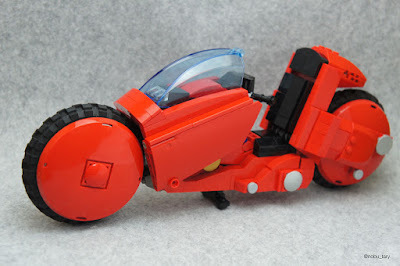 You could be interested checking out our compilation page for Keneda's Bike MOC's for many great examples.